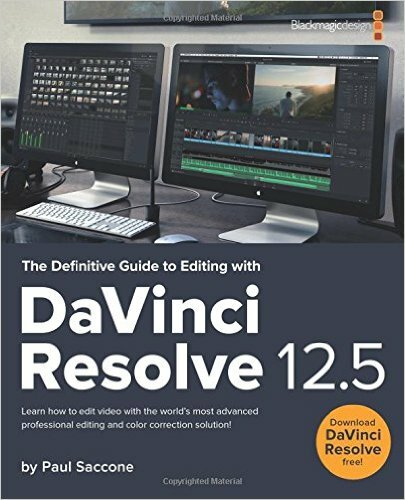 This official hands-on training book covers all aspects of editing with DaVinci Resolve 12.5 and will teach to be a professional Resolve editor. Best of all, DaVinci Resolve 12.5 is free software that you can download and start using on your own projects today! You will learn: - How to setup projects, import media and use metadata to speed up your work. - Marking selections, editing clips in the timeline, and context sensitive trimming. - Working with titles, adding graphics, adding effects, and animating with keyframes. - Syncing audio with video, mixing sound, and using audio overlays for editing. - Basic color correction techniques using DaVinci Resolve’s legendary color tools. - How to finish and deliver a project to the web, for broadcast or for digital cinema. - Dozens of tips throughout the book that will help transform the way you work! Download your few version of DaVinci Resolve 12.5 today!